In several of my earlier blog posts, I’ve written about Sketchpad activities that present factors and multiples in puzzle form (see, for example, When Factors Put on Their Dancing Shoes and When Factoring Gets Personal). 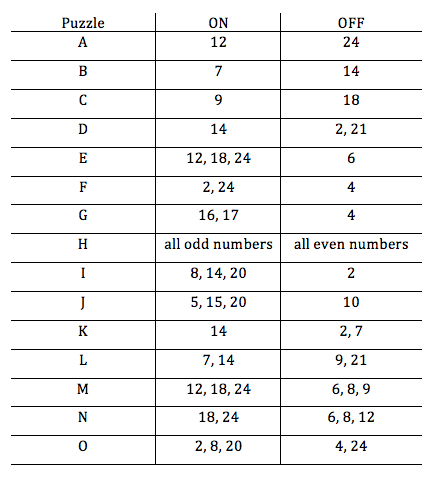 Now I’d like to introduce you to another puzzle of mine called Open the Safe that also focuses on factors and multiples. Below (and here) is an interactive safe built with Web Sketchpad. Each of the 24 squares of the safe starts with its light off. Pressing any of the 12 buttons on the safe turns the lights of certain squares on, coloring them yellow. The best way understand how the light patterns are generated is to play with the safe. Pressing the button on square 5, for example, turns squares 5, 10, 15, and 20 from blue to yellow. Similar experimenting suggests that pressing the button on square n changes the colors of squares that are multiples of n.
Pressing two buttons in a row produces interesting results. For example, pressing the 12 button turns the 12 and 24 from blue to yellow. By then pressing the 8 button, the 8 and 16 squares turn from blue to yellow, but the 24 square turns from yellow back to blue. After a few minutes of play, students turn their focus to the puzzles in the table below. In each puzzle, the goal is to unlock the safe by pressing buttons so that certain squares are “on” (lit in yellow) while other squares are “off” (shaded blue). Consider puzzle A: How can you turn square 12 yellow and square 24 blue? Note that the puzzle says nothing about the other squares—these squares can be either yellow or blue. There are several solutions to the puzzle. You can, for example, press button 4 followed by button 8 or press button 12 followed by button 8. The puzzles, of course, give students practice in recalling factors and multiples of numbers between 1 and 24. But the puzzles are really aimed at giving students an opportunity to engage deeply with these concepts, developing reasoning skills and insights into the mathematics that occur naturally while solving the challenges. There are 15 puzzles in the table above, but don’t stop there: Ask your students to create Open the Safe puzzles for each other. Share their work in the comments section below!